California, 1930 Steve Rogers (Matt Salinger) is selected for the top secret 'Operation Rebirth' programme. Injected with a serum that dramatically increases his strength and issued with an imposing form-fitting uniform, Steve is transformed from an all-American homeboy into an all-American hero. Pitched against Hitler's own human weapon, Red Skull, Captain America is over powered and sent crashing on a missile in to the frozen Arctic waters. Now, 40 years later, the perfectly preserved Captain America is revived from his icy bed and returns to his fight with Red Skull, who is still the maniac mastermind behind most of the world's evil. In the best tradition of super heroes, Captain America leaps out of the comic pages and on to the screen in this all action adventure story of good versus evil. 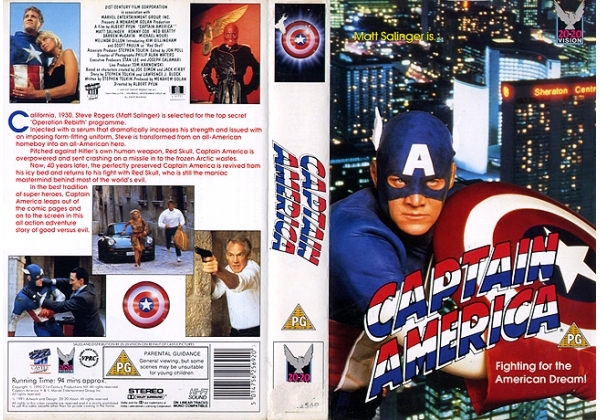 Or find "Captain America" on VHS and DVD / BluRay at Amazon.